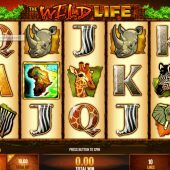 The Wild Life slot refers to the actual 'wildlife' itself and not the kind of wild life one might expect to live being a fire juggler or a high stakes poker player. 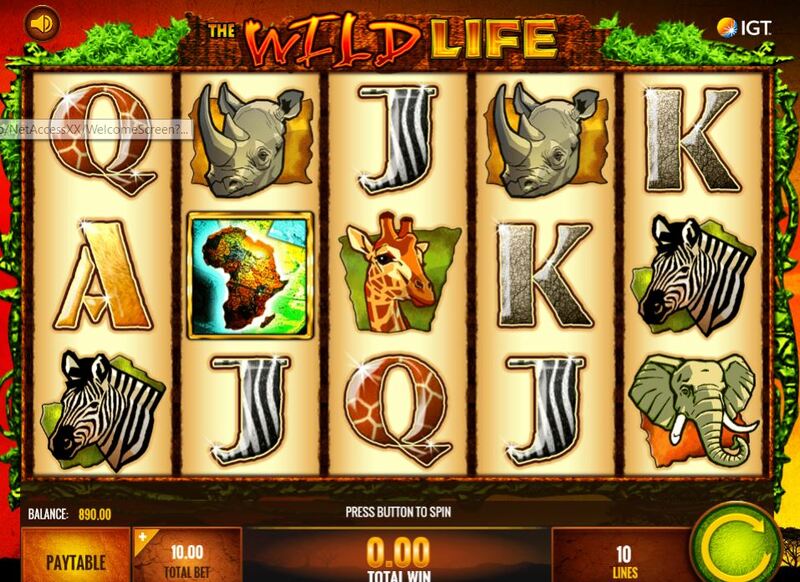 The wildlife in this case is of the African Veldt and its safari animals as we open a game with a background of the red and orange hues of the African sunset with symbols that may remind you of Microgaming's Mega Moolah slot or Ash Gaming's Wild Gambler. So will The Wild Life slot hit you with a roar or a whimper? Unusually for IGT we have very few pay lines, only 10 in this case. These are spread across 5 reels and 3 rows, although they do pay right-to left as well as just left-to-right which you would not normally expect. The icons are rather bland representations of the various animals of the region and the mighty Lion is the best pay of 250x bet for 5-of-a-kind. The Elephant, Rhinoceros, Giraffe and Zebra respectively pay 100, 50, 15 and 10x bet for the 5. The poachers must have been at work here as the card values all paying 5x stake for the 5-of-a-kind have thoughtfully been created from the skins of the animals above. We do get some action in the form of expanding Lion Wilds on the centre 3 reels and just to note these are a different more aggressive Lion than the top pay mentioned already. The remaining icon is present on all reels and is the outline of the African Continent which we need to land for the game's only bonus. If you land 3, 4 or 5 Africa icons anywhere in view you will be rewarded with 10, 15 or 20 free games. These can be quite rewarding as the expanding Lion Wild will become sticky so you can if lucky play some spins with all 3 middle reels consisting of Wilds, similar to the bonus round of WMS's Black Knight 2 slot. Unlike that game though, here you can earn 2 extra spins for each Africa scatter appearing, and bearing in mind the top-paying 5-of-a-kind is 250x bet plus the fact that if the first and last reels don't match you get paid from the right for 4-of-a-kinds, there is some big win potential here!